Taekwondo Grand Prix is a unique sports action game from Hello There Games. Experience authentic Martial Arts like never before in a game. Tactical action mixed with realism as you move like true professional fighters, thanks to motion-capture technology. Focus your mind, hone your skills and calibrate your reflexes. Register to compete and earn your place at the finals during the World Taekwondo GP Manchester 2018. 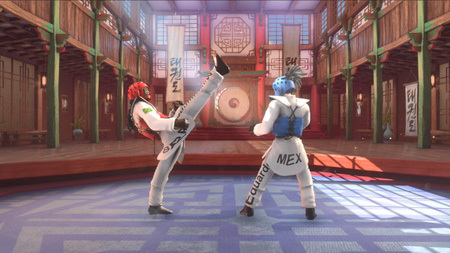 The game features beautiful environments including The Dojang, Mexico, Korea and GB Arena. If you get stuck in the game, check out the video walkthrough and gameplay for the game. This entry was posted in PC Games, Walkthrough and tagged Taekwondo Grand Prix Cheats, Taekwondo Grand Prix Game, Taekwondo Grand Prix Gameplay, Taekwondo Grand Prix Guide, Taekwondo Grand Prix Hints, Taekwondo Grand Prix Review, Taekwondo Grand Prix Solutions, Taekwondo Grand Prix Strategy, Taekwondo Grand Prix Tips, Taekwondo Grand Prix Walkthrough by Marvin. Bookmark the permalink.